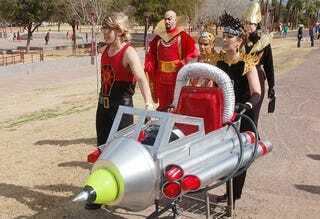 February 8th is the next Idiotarod. It's a take on the famous sled race—rather than using sleds & dogs, it's shopping carts and people. In themed costumes. And booze fueled tests. And sabotage (though, I must admit, I'd not heard of anything grosser than pudding being smeared. The new rule has me a bit grossed out). And bribery. And prizes. I haven't participated in a couple years, however, I think I'm going to volunteer again this year. It's a really good time, and I don't mind being a sober/helper person. My favorite part of my last participation was when a team's cart broke at a stop, and they decided to MOOP it (MOOP=Matter Out Of Place=LITTER) at one of the stops. The friend I was judging (yes, there are judges too!) with was super pissed (because MOOP is terrible, and you will pay). We loaded the cart up into his truck and went to the next stop. We waited for the offending team and used a bike lock to chain the broken cart to their replacement, and refused to take a bribe to release the lock. Don't be a MOOPer! WE'RE JUDGING YOU! It tends to be a pretty good time.